TANEGASHIMA, KAGOSHIMA PREF. 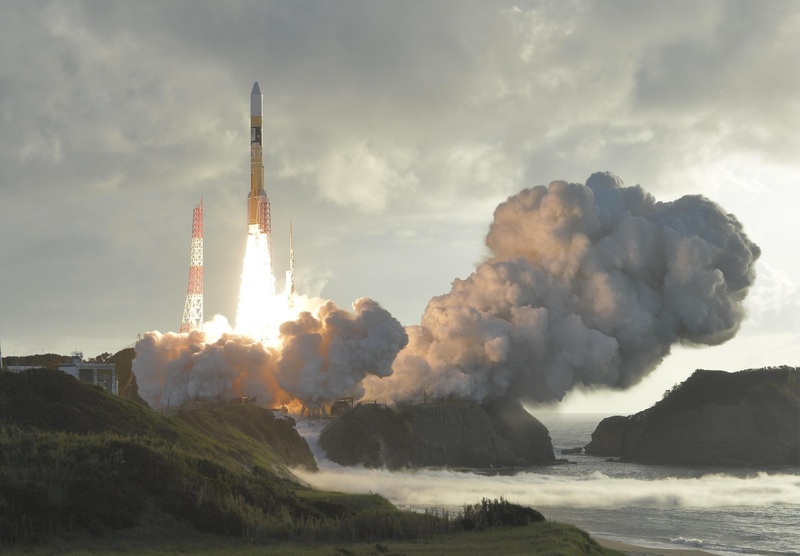 - Japan successfully launched its fourth and final quasi-zenith satellite into orbit on Tuesday to help create a new system to improve the accuracy of GPS data for a range of applications, including smartphones and vehicle navigation systems. 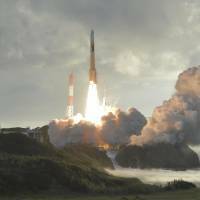 Mitsubishi Heavy Industries Ltd. and the Japan Aerospace Exploration Agency (JAXA) launched an H-IIA rocket carrying the Michibiki No. 4 satellite from the Tanegashima Space Center in Kagoshima Prefecture at 7:01 a.m. The government satellite was separated from the rocket about 28 minutes after liftoff and entered its target quasi-zenith orbit. The Michibiki satellite system complements GPS, helping reduce positioning errors in the U.S. system to around one meter. It is also designed to realize positioning accuracy of a few to scores of centimeters by using data received by electronic reference stations set up across Japan by the Geospatial Information Authority. The Michibiki system helps reduce areas where radio waves are difficult to reach, such as locations between tall buildings and in mountainous areas. With the launch of the new satellite, radio waves from the Michibiki system can be received in Japan constantly. The government plans to start supplying positioning data in fiscal 2018 using four Michibiki satellites — the No. 1, No. 2 and No. 4 quasi-zenith satellites moving almost directly above Japan and the No. 3 geostationary satellite. Experiments have been conducted on such positioning data for introducing autonomous heavy machinery at construction sites and self-driving tractors on farmland. Other applications include a tourism navigation system combining augmented reality technology with positioning data from Michibiki. The government plans to operate seven positioning satellites in fiscal 2023, to make its Michibiki system fully independent from GPS. “We’re planning to conduct in November an experiment on a self-driving bus utilizing the Michibiki system on the main island of Okinawa,” said Go Takizawa, executive director of the Quasi-Zenith Satellite System Strategy Office at the Cabinet Office’s National Space Policy Secretariat. The No. 1 satellite was launched in September 2010, the No. 2 in June this year and the No. 3 in August.